Do You Wish We Had Never Signed Hayward? Re: Do You Wish We Had Never Signed Hayward? I wish he didn't get injured. I wished IT was 7" taller too. I think Hayward will fit into any style of play the Celtics can dream up. He can pass well, score well, rebound, and defend. I'm thankful for the team and organization we have. Me, too - which is what made me think of the question. We assigned 30% of our cap to a player who played a total of 5 minutes and we still went to the ECF last year. 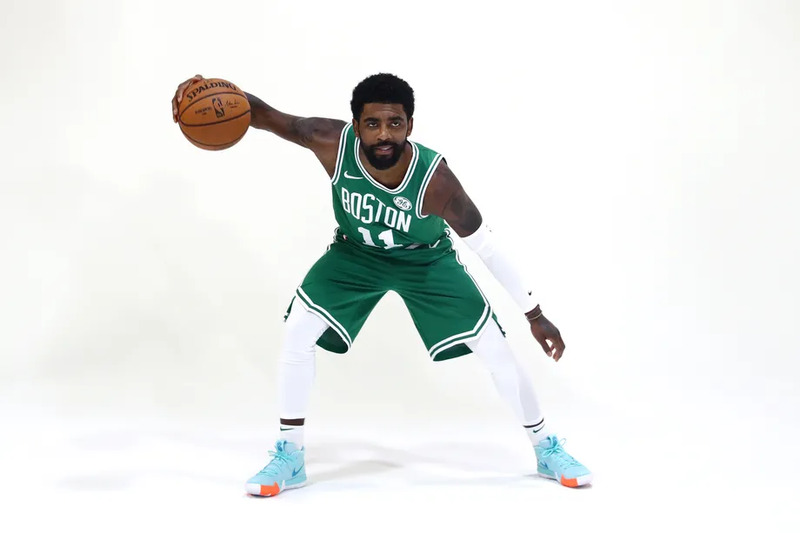 Not only without Hayward, but without Kyrie, too - that is crazy! But, in another world where we didn't make the BKN trade (or the Tatum/Fultz deal by extension), we re-signed IT to a huge contract, and Horford chose to go elsewhere, well, then this would put us in an entirely different position. Our entire livelihood would have depended on Hayward and it would have been devastating. I was just trying to ask the question, if you had it to do all over again, would you make a different decision? One of my main reasons for being in the middle is because Danny has been on one of the greatest GM runs of all-time. If he wasn't able to sign Hayward, he surely would have made other dramatic moves. Can't we assume another impact player, say of Joe Ingles' caliber, probably would have pushed us to the Finals. That would have been exciting! And it still would have allowed us to sign our own FAs when the time comes next spring. Like I said, though, good for Celtics Strong nation. You people really are a stand-up crowd. Having Hayward's back like this is not something all franchises can count on. I can't imagine the Miami Heat fans are too happy still paying Chris Bosh's max contract, despite the fact that he helped bring them two championships. The premise of this thread and east subsequent post you try to justify it with doesn’t make any sense. Wishing for Joe Ingles instead so we could’ve won one extra game in May is ridiculous. I have no idea why you go to this parallel universe where we didn’t make the BKN trade or signed Horford (but we did steal IT from Phoenix), yet still expect him to have the same injury when ALL of his teammates would have been different (and at least two of his opponents) at the time it happened. I really don’t see the logic there. Basically what you’re saying is that we bought a stock for $100 (all-star in his prime), it plummeted to a penny stock for a year (inactive), is currently at $75 (shaking off the rust and regaining strength/conditioning/mentality) with a forecast of $150 (main cog on championship team).... and you wish you bought a stock for $60 that’s now maybe $70. If you were a day trader, you should have done that. But Danny doesn’t hand out max contracts for what he gets in year 1 only. Nobody could have predicted what happened, and without Kyrie I don’t think Hayward (or Joe Ingles) made us better than GSW last year. This year with Kyrie and Gordon healthy, we are close. So what did he really cost us, an Eastern Conference title? We are the Celtics, nobody is celebrating 2010. I’ll take what he gives us on the backend of his contract than the missed year that would have led us to maybe two or three extra wins that didn’t hang a banner. Hayward was the right play in July 2017, and everything that’s happened since still doesn’t change that. I think we saw flashes of what he can be last night and I was pleased good to see him doing well. TPs to both you and gouki, and yes, I am definitely a huge return on investment guy in all facets of my life (value, efficiency, etc). I am certainly hopeful of Hayward's return to a near all-star level, but none of us can be sure. I do believe he will at least be a useful player who helps us win games on offense and defense. Well he definitely looked better tonight. We may get the ROI we expected from him sooner rather than later at least. Totally! I was happy to see him be much more active and decisive. He could use a bit more 'explosiveness', but last game was completely different than game 1 and the pre-season. Let's hope he continues to show more progress! As for GreenEnvy's response above; perhaps you could be a little more respectful. I didn't create the thread in order to tear into Hayward. Paying Hayward an extra $30M last year to do nothing shouldn't necessarily be a slam dunk for every Cs fan when we very easily could have (and probably would have) made the Finals with another starting level player or two coming off the bench. I get it, we probably wouldn't have won the championship, but you just never know what will happen until it plays out. Going forward we would have had more flexibility as he is more of an expensive luxury (what a luxury!) with Tatum and Brown taking such big leaps. Ingles, Simmons, Evans, etc were just other options that could have helped us for much less money and commitment. It is not ridiculous that people wouldn't be 100% all-aboard the 30% of-our-payroll Hayward right now. Also, the premise that he will somehow be 150% of his former self seems like a reach (best player on championship team? Really?). I think most of us would be thankful if he reached $.90 on the dollar. I realized a day after I posted the thread that I should have worded it differently. If the poll read, "Would you have still signed Hayward?" instead of "Do you wish we had never signed him?" then I think it would have been less harsh sounding and might have brought in slightly different results. As I mentioned previously, I think more people were against his signing when it happened than they are right now. That goes to show how much Cs fans support one of 'theirs' more than anything else...and that is pretty cool. Not sure if you are more of a Rozier fan, but I think we will have a 2nd shot at this decision next summer. If the Cs deem Rozier a staple of their future, then Smart will still be tradable for a TPE at the very least. A lot of teams will have cap space next summer and some will whiff on their targets. Smart would make a nice back-up option for a team looking to instill a tougher attitude into their team's culture. No, I don't. Hayward was the best of the best we could acquire and we did it. Danny tried for Durant and couldn't get him. I'll take Gordon any day! I highly disagree. Even if you think he isn’t a fit for us going forward (which I’d also disagree with), he has value around the league and signing him is better than letting him walk. So I'm looking at these early games for and indication of where we might be 20 games in. Hayward is going to get a lot of minutes. Worth it. Liked the rebounding. Shooting coming to form nicely. Finishing okay. As for the younger players upcoming paydays and opportunity cost of sighning Gord, first I'd say that the cost in team salary and tax to field a legitimate contender is outrageous, and owners say they'll pay it. It seems to take 9 starters including 4 all stars, and some insurance ring chasers. That's a lot of money. Rozier might get $15M+ from us after all. Jalen too. That's what it's going to take. Do I regret signing Hayward? Heck no, he’s going to be the best player on this team by mid season. Yeah. Really really looking forward to watching full-strength Gordon out there with the other starters in a few months. Already liking the curls and cuts on offense, and I see the outlines of another long, plus defender. We’re gonna be tough! It's a moot question. Quite a different team when Hayward was signed. Today, they don't sign him. Right now, they are having chemistry problems with all those good players they have. I hardly think it's a matter of having chemistry problems because we have too many good players. I think those chemistry problems would exist regardless. I mean in retrospect yes signing Hayward to a max deal when we drafted two different players #3 overall who play his position looks a little ridiculous. And yes, many of his detractors will point out that Hayward is on his 9th NBA season and has averaged 20 pts per game only once. And I get that somehow Utah actually improved without him. But Hayward is still a very servicable vet - and ok, it's a little dangerous to tie up 30 million a year in a player who's sub-elite at their position, but sometimes you have to overpay for guys that will back up the coaching staff. And maybe Jae Crowder (now playing in Utah) is currentlyl outscoring Hayward, but Jae Crowder isn't walking through that door to play for 7.3 million a year (his current contract) until 2020 folks. Do people seriously think we wouldn't sign Hayward if given the chance today? Brown and Tatum aren't even close to haywards defensive ability yet. Offensively Hayward is better than both as well, although Tatum is closing in. That doesn't mean Hayward wouldn't have been signed. I think long term neither Tatum nor Brown will play the 3. Pointing out those stats is a bit foolish. As a consistent starter (ie the 306 games over 2014-2017) he averages 19/5/4. So it's hardly like his lone season over 20 came out of nowhere, as he had 19.3 and 19.7 seasons before. In what world is winning 3 less games a better season? It's also far too early to say Hayward is sub-elite, which he isn't. Wait for him to return to Paul George levels.